The Garden Club of Princeton took a walk on the wild side this week. In two brisk and sunny morning sessions organized by their Conservation Committee, ten volunteers removed invasive plants from the strip of land between the towpath and the canal, liberating native shrubs and wildflowers from an oppressive tangle of exotic weeds. 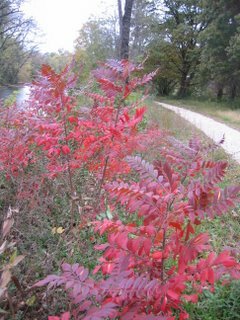 The radiant fall colors of silky dogwood and winged sumac (in photo), and clear views of the water, can now be enjoyed by the many users of the path. Wielding loppers, volunteers removed multiflora rose, Chinese privet, purple loosestrife, Japanese honeysuckle and oriental bittersweet. Many native species are competing with the exotics for sunlight, including the above-mentioned shrubs, elderberry, evening primrose, rose mallow Hibiscus, ironweed and the rarely seen blue flag iris. The trimming back of the aggressive exotic species will allow the natives the advantage they need to prosper. This wild brand of gardening is hard to approach in a perfectionist way. Given its grand scale, neatness is hard to achieve, and weeds are never fully conquered. Rather, one acts strategically, removing the most aggressive weeds, and in so doing shifts the balance of energy towards the desired species. Over time, the natives grow stronger, shade out the weeds, and a dynamic and ornamental border, full of nectar and seeds, makes a visit to the towpath more gratifying for both people and wildlife. Thanks to Kathleen Biggins and Margaret Sieck, co-chairs of the Conservation Committee, for their initiative, and the help and company of the garden club volunteers as we restored some ecological balance along the canal. The section of the D&R Canal State Park getting all this attention is located between Washington and Harrison Streets. Join in on a fall foliage walk through Mountain Lakes Preserve, following the new trail route that links Mountain Lakes to the Great Road, via a newly completed boardwalk. With leaves of native trees falling, it's easier to see a "second forest" of species from distant continents. Exotic species tend to keep their leaves later into the fall, so appear as a green layer in the understory. 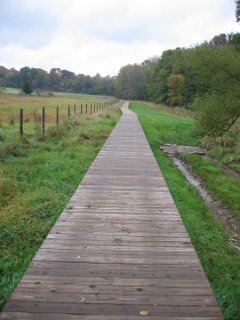 The boardwalk, built by Princeton Township with the help of a grant from the J. Seward Johnson, Sr. Charitable Trust, passes by the prairies and wetlands of Coventry Farm. The walk will be at 9am, Saturday, October 28. Meet at the parking lot for Community Park North and Pettoranello Gardens, just off Route 206 on Mountain Avenue in Princeton Township. I'll be leading a nature walk along the D&R Canal towpath on Saturday, October 7, at 9am, sponsored by Friends of Princeton Open Space. 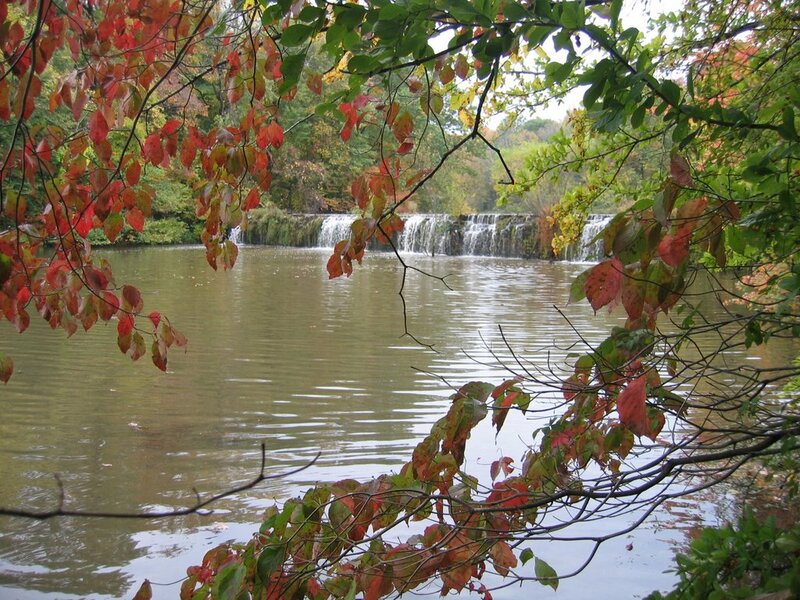 The canal corridor serves as refuge for considerable native diversity, and the D&R Canal State Park has begun managing some areas to maximize native wildflower displays. Great blue herons, giant oaks, an occasional bald eagle and 50 species of wildflowers are all to be found along the canal. Steve will help with plant ID and tell of volunteer projects underway to restore habitat and beautify the towpath. Meet on the canal towpath at Washington Street in Princeton. Parking is available on the West Windsor side of the canal. For more information, email me via this blog.